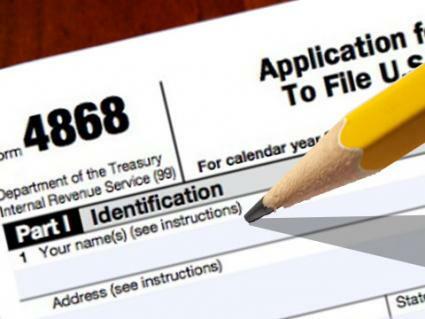 IRS Tax Form 4868 is the form you must use to request an extension of time to file your individual tax return. Form 4868 is due on or before the original due date of your return. In most cases this is April 15, but if April 15 falls on a holiday or weekend, you have until the next business day to file your return or request for extension. Your request grants an automatic six months of additional time to file your return. If you request an extension, your tax return is due on October 15. To file tax form 4868, you must provide your personal information and information regarding your tax estimates for the year. The part you must fill out consists of a voucher-style form that is approximately one fourth of a page. Your Name - List the primary taxpayer's name and Social Security number. If you file single, head of household, or file a return separate from your spouse, you are automatically the primary taxpayer. If you file a joint return with your spouse, you may choose either person to be the primary taxpayer. Your Address - List your current address. Your Spouse's Information - If you are married and file a joint return, list the name and Social Security number of your spouse. This person is also considered the secondary taxpayer. Estimate Your Tax Liability - Estimate the amount of tax you expect is due on your income on line four. Use information you have available to you to make this estimate. Estimate Your Tax Payments - If you have withholding credits or your make estimated tax deposits during the year, list the amount on line five. Balance and Payments - Subtract line five from line four to estimate the amount you'll owe on your tax return. Report the result on line six. If you make a payment with your request, indicate the amount you're paying on line seven. Out of the Country - If you are outside of the country, but are a U.S. resident; or are a non-U.S. resident with no wages subject to U.S. income tax, check the applicable box for line eight or line nine. When you request an extension of time to file, the IRS requests that you estimate your tax liability for the year. This means you are expected to make a reasonable effort to determine the tax you may owe on your income from all sources, minus any withholding or other credits you're eligible to take. If you estimate that you owe tax, you should make a payment toward your estimated liability. For many taxpayers, this seems like an odd request because if one could easily estimate his tax liability, he would probably already have his tax return prepared. Use the information you have available to you to estimate your liability. If you don't know if you will owe tax, based on the information you have, it's acceptable to estimate zero tax due. The IRS allows two methods to submit tax form 4868. By Mail - Similar to the address you send your tax return to; Form 4868 is mailed to a specific address based on the state you live in. The IRS publishes mailing addresses in the instructions for Form 4868. Online - The IRS now allows taxpayers to file Form 4868 electronically through the IRS website for free. To submit the form electronically, you must create an account to use the efile system. Once you receive your password and login information, you can securely transmit your request. The most important rule to remember when you request an extension is that the request only allows extra time to file, not additional time to pay tax. This means that if you actually owe tax on your return, the IRS assesses a late payment penalty against you for paying after April 15, even if you have extra time to file your return. The best way to avoid penalties is to either file your return and pay any tax on time, or accurately estimate your tax due and pay the amount by April 15. If you actually owe no tax on your income tax return, you do not have to request an extension of time to file and will not be penalized for filing late. You have three years from the date a return is originally due to claim your refund.